The Android’s open source OS is not only giving a strength but also making it the most loving operating system in today’s world. The open source means that anyone how know the programming a little can potentially juggle the codes to make it more user-friendly and remarkable operating system. In this handy guide, you will find the way to root Samsung Galaxy S2, undoubtedly this is one of the favorite handset for most of the people around the world. A complete and fervent reading of this guide is essential, express your concern in reading this and at the end, you will find it easy to root Samsung Galaxy S2. The custom operating systems known as the “ROMs” are capable of removing unwanted bloat-ware and also can boost up the speed of your handset. However, in Android, you can only install or do firmware updates which are officially authorized by the manufacturer. It means, to perform the Android customization you need the root access to your handset. Although, gaining access to root Samsung Galaxy S2 may seem a bit stealthy and eerie, it is same like accessing the admin account on any computer. It also allows you to play with the various software elements of your handset and change the setting you like. For your understanding, a simple example is being able to change the start-up animation which comes as default in handsets. Although, gain access to root Samsung Galaxy S2 is not a daunting task and may seem like playing a game on your Android handset, but actually this spooky job is not for the lily-livered. There is a need to download and install Kies application, this will make your handset communicate with your computer and you can perform the farther procedure easily. Go to the Samsung’s website to get these files and make sure they are installed well before proceeding to next step. There is also a need of insecure kernel. Although, it is always good to pick a code that resembles with the code of your handset. You can check it by simply going to “About phone” section of your handset. This step is avoidable as on completing the rooting procedure once you can reload a secure kernel. Finally, you need to grab one essential software “S2 Root”. Without enabling the USB debugging mode you can’t proceed to the next step: therefore, it is essential to make it sure. Turn off the handset and hold the volume down + home + power button. This will make a reboot and a screen will appear displaying a warning against the dangers of installing the custom OS. Here, you can place the phone in the Download Mode by pressing the volume up key, but remember you have to do this at your own risk. Make sure your handset is properly connected to your computer, then run downloaded Odin3 through your PC. Watch the top left corner of the Odin interface, make sure it is yellow, this is a sign that your phone has been recognized. The check boxes of the “Auto Reboot’” and the “F. Reset Time” should be checked. Hit the PDA button and select the kernel that you have already. Relax a bit and then press the ‘Start’ button. On completion the whole procedure, your handset will auto switch off and a green “PASS notification will appear on your computer’s screen. On rebooting the standard Galaxy S2 a boot screen will appear with the yellow triangle having the exclamation mark at the foot of the screen. This means that insecure kernel is working well. Be patient, the reboot will take some time, make sure it is properly rebooted, it is the time to start up the S2 root. A little warning message will appear in the case of insecure kernel and employing the enabled USB debugging mode. Hope, you have followed the whole guide carefully, there is no chance of such mistake. Simple Click “OK” to proceed. There may be a problem with the Microsoft .net Framework version in the Windows XP operating system. Fear not, because you can get the update from the official Microsoft website. S2 root has the user-friendly interface, you will not find any difficulty in operating this software. To avoid any inconvenience if you are experiencing while rebooting your handset in the form of an annoying warning triangle you need to grab the secure kernel back. You can grab easily by following the “Getting Odin3” step. Congratulations! 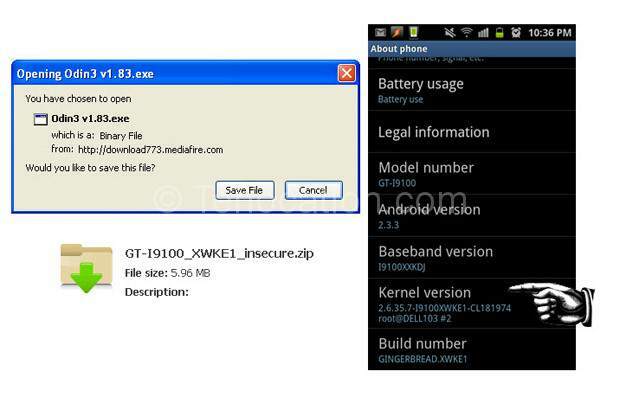 Your attempt to root Samsung Galaxy S2 is successful, enjoy the freedom of customizing the operating system.